Rustic things appeal to Virginia Allain. Farmhouse decor takes us back to our country roots and connects us to our ancestors. A fireplace gives a room a focal point. It also gives you a great place to display seasonal decorations. 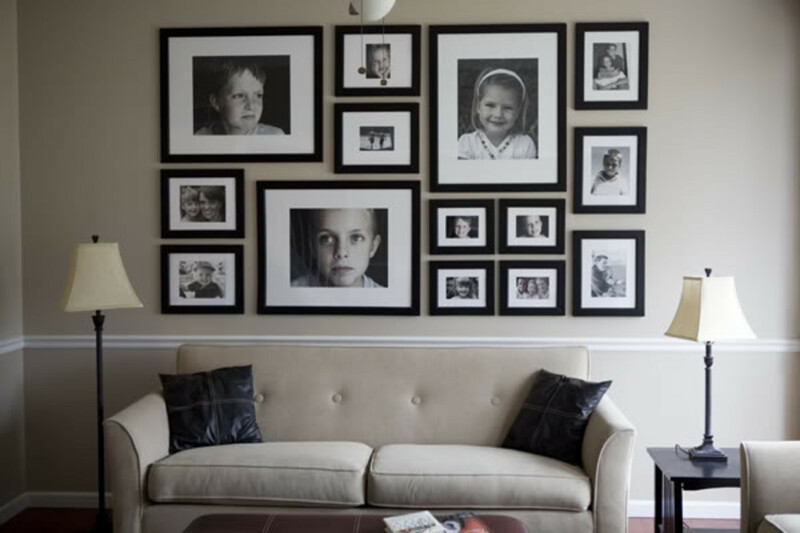 Usually, the furniture in a room is arranged with the fireplace at the heart of the room. Creating a harmonious selection of autumn pieces is a perfect way to celebrate the season changing from summer to fall. 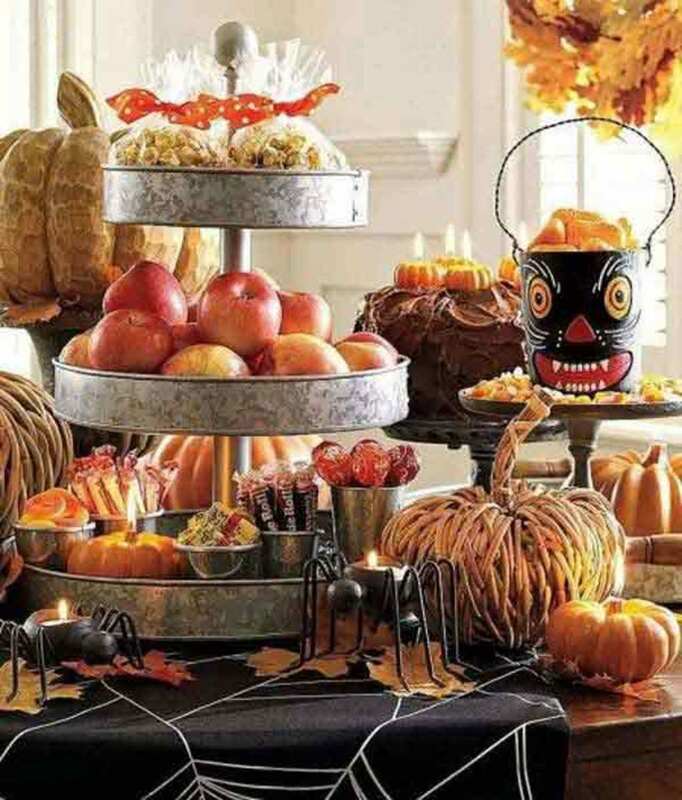 The great part is that your display can incorporate some Halloween elements and later Thanksgiving pieces to get maximum mileage out of your selection. Real pumpkins are fun, but you have to worry about one getting rotten and ruining the wood of your mantel. Look for wooden or metal shelf-sitter pumpkins will last for years. These pack away compactly until next season since they are usually pretty flat. Start out with fall-themed decorative items on the mantel in September. 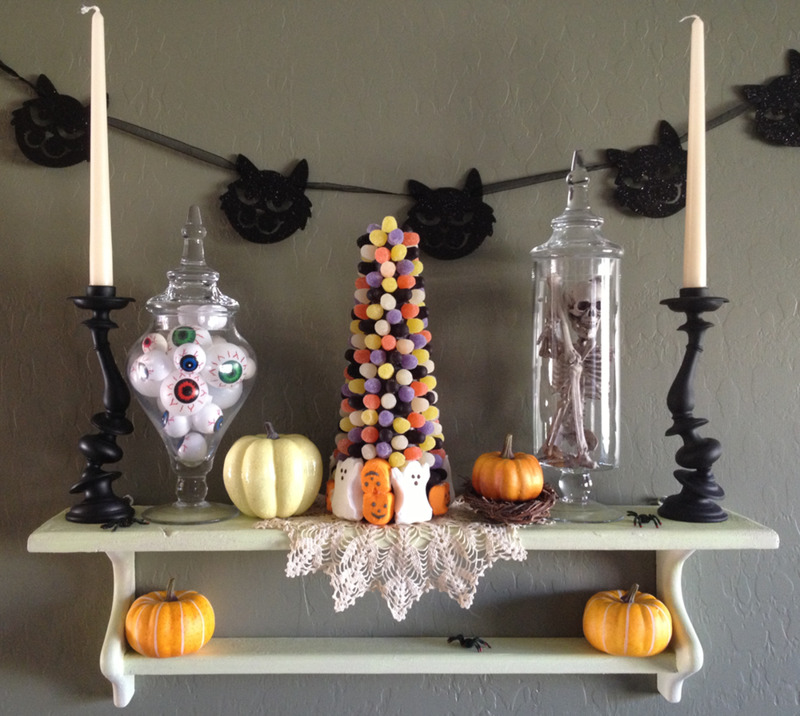 By subtracting a few things and adding in bats or black cats or decorative spider webs, it becomes a Halloween-themed mantel in October. 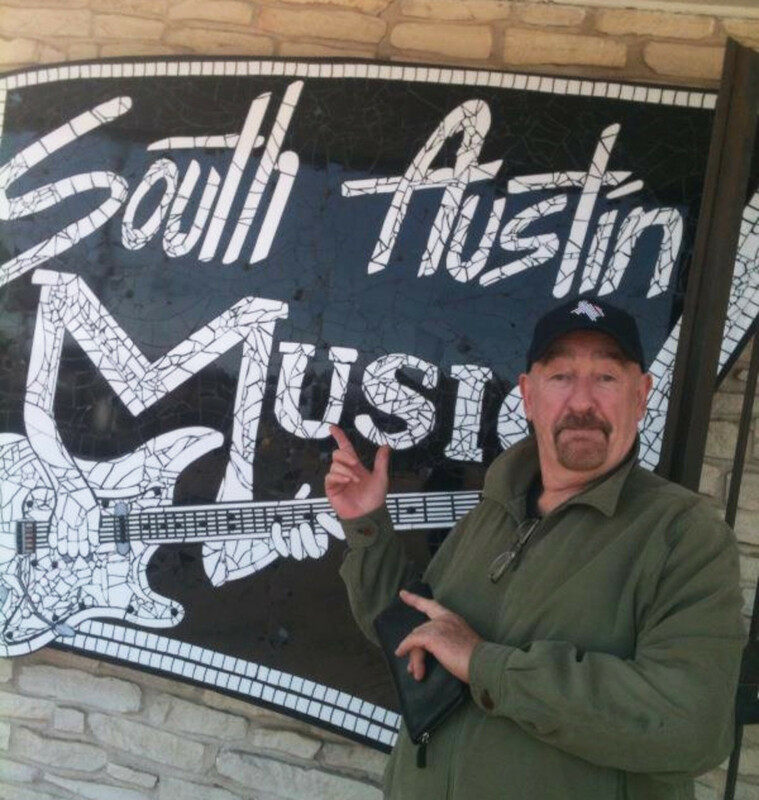 Then, it's time to transition to Thanksgiving. Just a few changes (plus removing the spooky touches) and you have your November mantel ready to go. I learned from my mom about adding seasonal touches to the home. 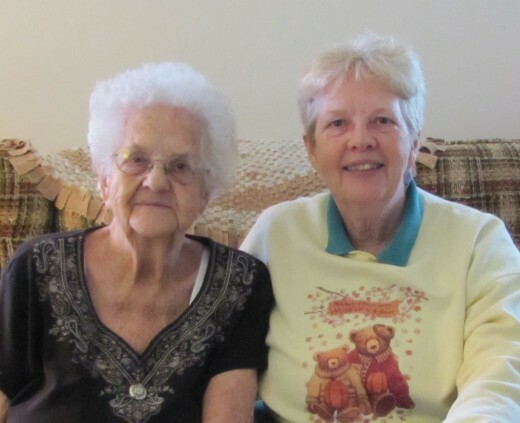 She always had the flair for combining a few things she had or making something new just for the season. I'm not nearly as crafty as she was, but think I inherited her love of display. People usually compliment me on my holiday and seasonal arrangements. Sure you could go find some of these in the woods, but why risk getting poison ivy. This faux bittersweet vine adds color and a natural look to your display. You'll get years of use from it. I remember hunting in the woods when I was a child for these. They make colorful arrangements for fall in the house. This is quite realistic and brings that natural fall color into your living room. I like how full it is. Dress it up with the addition of some yellow leaves and some acorns. I love decorating our home for Autumn time. There are so many gorgeous things to decorate with at this time of year and lovely colours. You have some wonderful and beautiful ideas here. Look at the variety available. These store easily to use again next year. Check your local farmer's market for miniature pumpkins and odd types of gourds. When using real gourds, be sure to put plastic under them in case one should go rotten. You don't want to spoil your wood mantel. (I've had this happen to my dining table, so I know first-hand that you must keep a close eye on natural decorations and protect from possible mishaps). 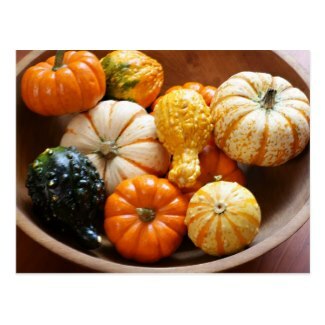 You can also opt for these faux gourds with no such worries. Another assortment but without the pine cones this time. These are lightweight and quite realistic. I've had mine for years and there's little that can go wrong with them. The pumpkin below was made with a length of clothes dryer hose (the kind that vents the hot air from the dryer). 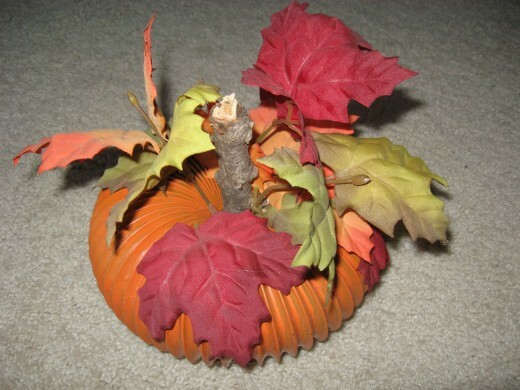 Use dried fall leaves or artificial leaves from the discount store or a craft store like Michaels. Use a craft glue to attach the stem and the leaves. I like quick and easy tutorials on video. Guess I'm a visual learner. Here are some good ideas from YouTube. 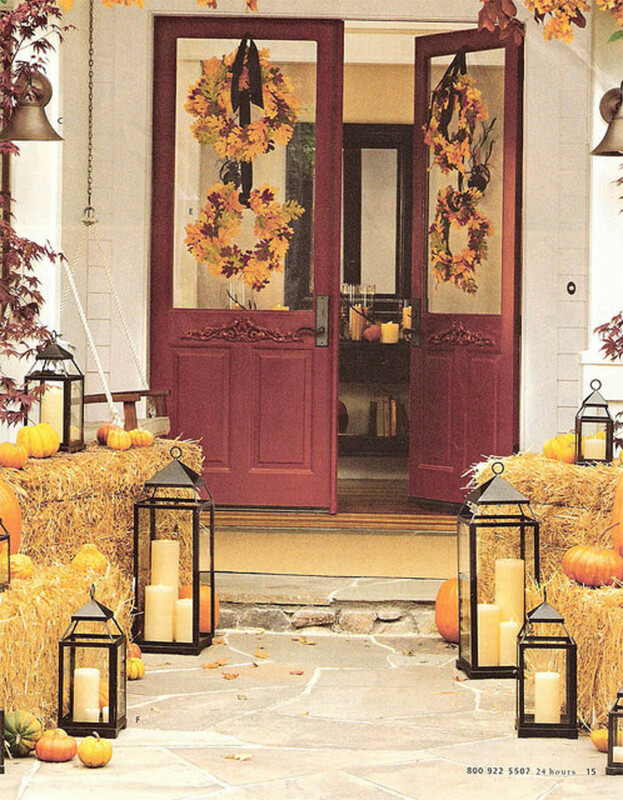 This is a Hometalk pinboard (like on Pinterest) with dozens of ideas for fall themed banners for a mantle or the wall. 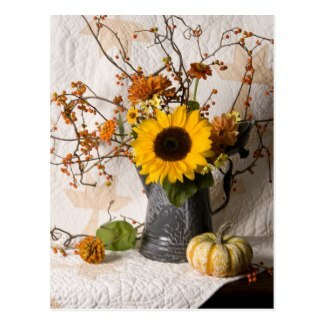 How about a fall mantle with the pizzazz of silver added? This one uses silver and gold for a sophisticated look. For these Fall decorations, I used metal stars, a lantern, a wooden bead garland, some bittersweet and a chalkboard to decorate this mantle and hearth. Tutorial to make an orange burlap wreath. It looks great over her fireplace. A swag of colorful fall leaves, a stack of books, and a simple pumpkin put an autumn spin on this mantle. This one has a rustic, homespun look to it that teams up well with fall leaves, gourds, pumpkins, bittersweet vines and other natural elements that we decorate with in the autumn. Unroll these lights and twine them into your fall garland or leaves on the mantel. 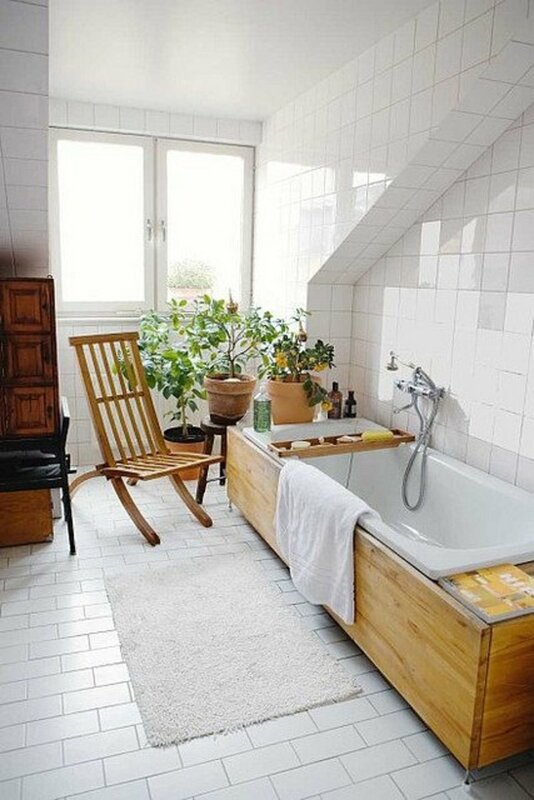 It doesn't matter if there is no electrical outlet nearby, as these operate on batteries. There's a timer to turn them on and off. 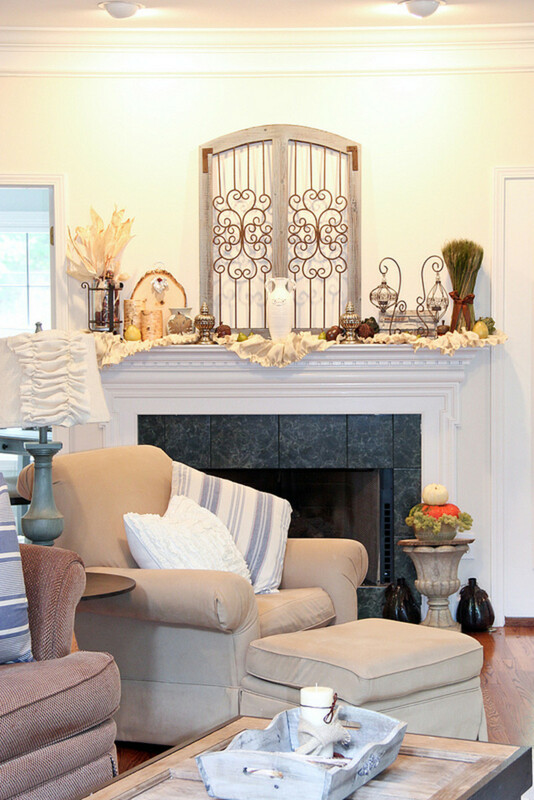 How long should you keep your fall mantel displays in place? Some people already have their Christmas decorations up by the last week of November, but I wait until after Thanksgiving to put away my fall decor. I love having the fall colors of orange and rust fill the house on Thanksgiving Day. 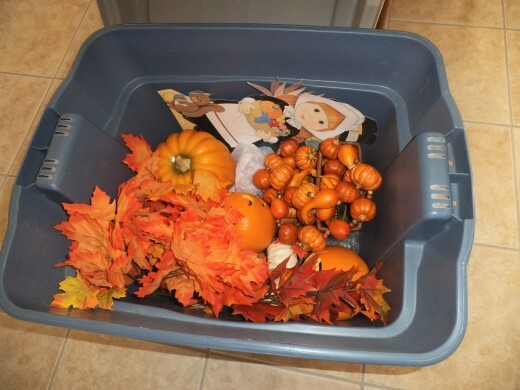 Tomorrow is December first, so I brought the storage tub in from the garage and filled it with baskets, leaves, and pumpkins. The pumpkins have jack o' lantern faces on one side, but after Halloween, I just turn them backwards to use for the month of November. There are some burgundy and yellow silk mums in there too. I have to crush the leaves down a bit to close the lid. Now autumn is safely stored until next September. 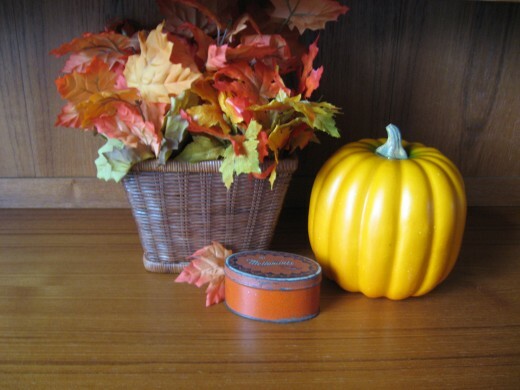 I love the autumn colors - and your decorating tips look awesome!